It’s time to say goodbye to the warm Summer sun and hello to the crisp Fall weather and fun family activities. Since the Fall season is upon us this means that ALL of our Committees will need more help than ever with all of the awesome events that are coming! The more volunteers we have the bigger, better and smoother the events will be for everyone. Right around the corner on October 6th, our very own Neighborhood Watch Committee will be hosting our National Night Out event, an “Old Time Carnival and Magic Show!” So put it on your calendar as we look forward to seeing everyone there while making new friends and new memories. This will be one of our biggest events of the year and Neighborhood Watch is asking for volunteers to help make this event a success. If you haven’t stepped up yet to help, this is a great opportunity to get your feet wet and see how you can help your community have more events like these! 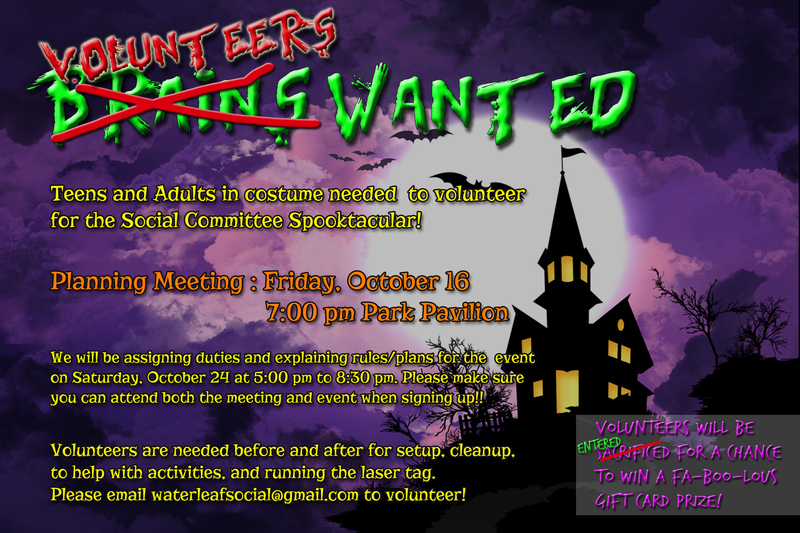 The Social Committee will be also be hosting two Halloween Spooktacular events for ALL the Ghouls and Zombies here in Waterleaf. This year we will have our first event for our children with special needs to give them some time of their own away from the other Monsters, Super Heroes and Princesses, followed by our regularly scheduled event for everyone else. Keep in mind that Halloween will be on a Saturday this year, and we all know how crazy all holiday events can get on a weekend, so please be mindful of the little ones running around that may not be paying attention to anything but getting their candy fixes. PLEASE keep your speeds low and your eyes open. As always we would like to welcome all the new residents of Waterleaf Falls. We are confident that you will love your new community as much as we do, and if you have any questions don’t hesitate to email us at the email addresses listed below. Sick of those pesky fire ants that invade your yard? Then participate in the fire ant suppression program developed and organized by Boy Scout Craig Harris. This young man is working on his E agle Scout project. Pledge today to join your neighbors in treating lawns throughout Kyle the weekend before Halloween, Oct. 23 – 25, so we can take back our lawns. While this is not a city-sponsored program, our Parks & Recreation Department supports Craig’s initiative. 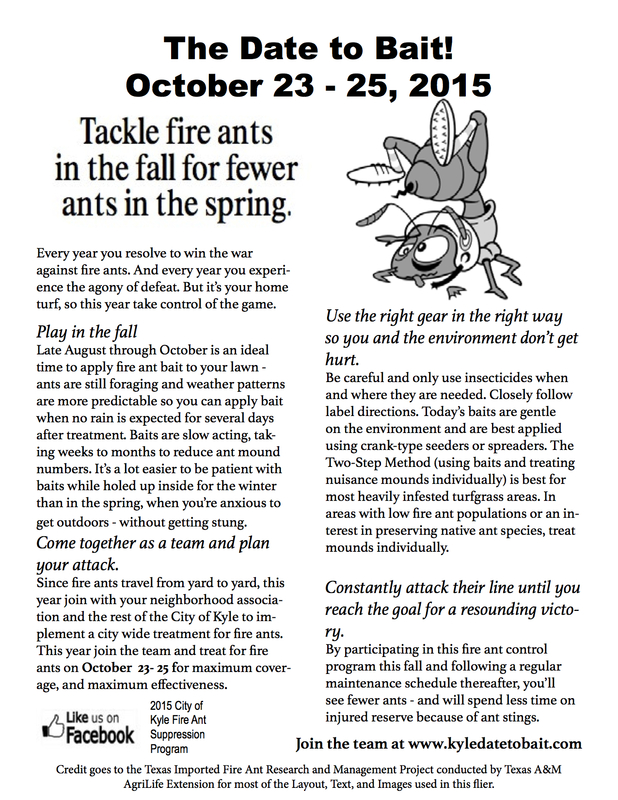 Learn more about Craig’s fire ant suppression at www.kyledatetobait.com. As you begin to prepare for Halloween, we’d like to remind you to think about the Trick-or-Treat Project and The Teal Pumpkin. Both programs ask you to include non-edible gifts to your goodie baskets. No need to ditch the candy, just add some stickers, glow bracelets, bubbles, crayons, or any other small gifts so that everyone has an equal chance to participate! There are a number of reasons that a child might not be able to eat candy (food allergies, dietary restrictions, feeding tubes, diabetes, etc), but that does not mean they should sit out during all the fun of the season. Be aware of your surroundings! Watch for cars, look both ways before you cross the street. Carry a flashlight to light your way as the sun goes down. Use your manners! Say thank you after someone gives you a treat. DRIVERS: DRIVE SLOW!! Watch out for the little ghouls and goblins! Turn your porch light OFF if you do not wish to participate. Go to houses where the porch light is off. This signifies that the person is not home or not participating. Please DO be respectful. Knock or ring the doorbell over and over. Give the person time to answer the door! Get in to any cars with strangers! While there is no set time, Waterleaf trick-or-treaters have started around 6pm in years past. Traditionally, the fun starts at dusk just when it starts to get dark. Use your best judgment and be mindful of neighbors’ schedules. Gates open at 5:00pm. Bring the whole family out for a fun filled afternoon. Concert for a Cause: DJ Versus Dance Party 6-9 p.m. Carnvial ends at 10 p.m.
Don’t worry, if you missed out on the fun from Thursday and Friday, the carnival will still be running! Free Entry To the Music! The town of Kyle was platted and the first lots sold sometime around the 15th of October, 1880. Parades through downtown around the middle of October have been a tradition since. The tradition lives on as we reflect and recognize the many founders of this great town. On Saturday, October 17, 2015, beginning at 10am, the Kyle Founders’ Parade will once again pass through downtown. The parade participants will be gathering at Gregg-Clarke Park and will head east on Center Street. They will end at the Mary Kyle Hartson City Square Park’s Gazebo. When the last parade entry is at the Gazebo, all gathered are invited to sing “Happy Birthday” to Kyle and have a piece of birthday cake. Additionally, the Kyle Market Days vendors will set up for an “Encore” event from 9a – 1p on the City Square. Best locations to watch the Kyle Founders’ Parade is on either side of Center Street between Gregg-Clarke Park and Mary Kyle Hartson City Square Park. Please stay on sidewalks or grassy areas along Center Street. Do not run into street when parade is going by. Join us for the 2nd year of the Kyle Youth Basketball League. The Kyle Youth Basketball League operates as a Division II Texas Amateur Athletic Federation (TAAF) Youth Basketball League. In doing so, it opens up the opportunity for post-league play via the regional and state tournament. A copy of the TAAF Youth Basketball League Rules are attached below as well as a link to the TAAF website. Registration will open October 6, 2015 and closes December 1, 2015. This League is made possible with the efforts of volunteers who are committed and will help to ensure that our league is a positive influence in the lives of our children. If you are interested in volunteering your time as a coach, team parent, score keeper, etc., please indicate that on the registration form. If you do not have a child participating in the league and would like to donate your time, please call Kristin Mueller at (512)262-3937. Join us for our National Night Out Celebration (see below) and mark your calendars for a special event next month to help get all of our pets registered with the city of Kyle. Kyle Animal Control will be right here in Waterleaf on November 14, 2015 at 11:00 am to register pets. Not only is this the law, it can help you and your pet be reunited should they get lost! Step right up and join the fun! Our annual National Night Out celebration is here! Join us from 6:00 pm to 7:15 pm for a hot dog dinner. 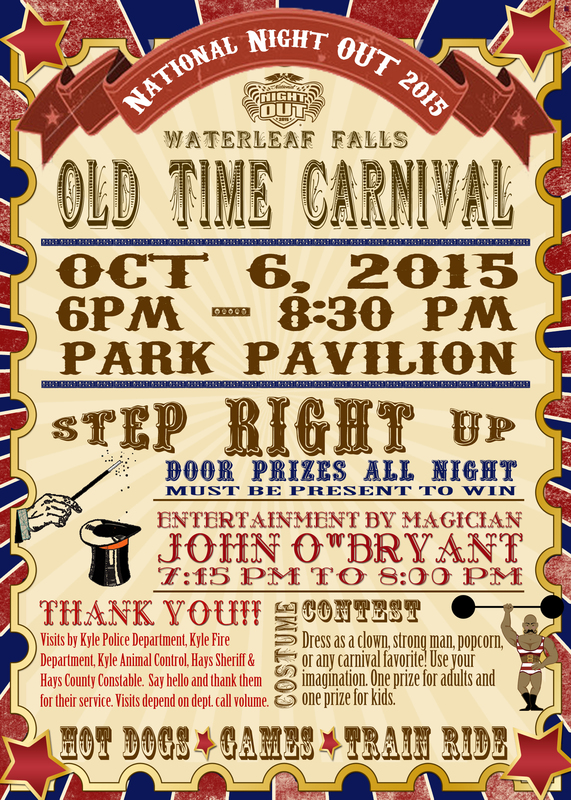 At 7:15 pm, we will have entertainment provided by magician John O’Bryant until 8:00 pm. We will be giving out door prizes all night. (Must be present to win). There is also a Carnival Costume Contest, so come dressed in your clown, strongman, popcorn, or other carnival favorite costume for your chance to win. One prize for adults and one for children. Kyle and Hays law enforcement officials will be in attendance as their schedule allows, so come out and say hello and thank them for their service to our community. 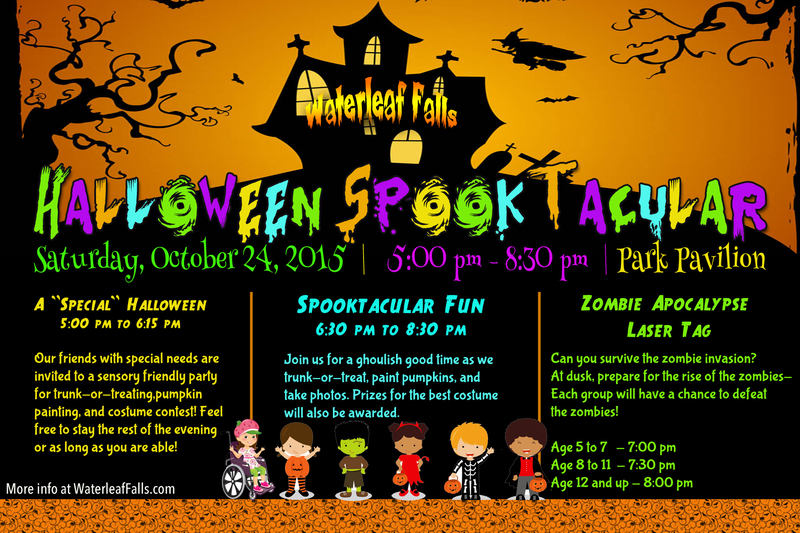 We will be throwing a Beast of a party for all the Waterleaf Monsters and Princesses. 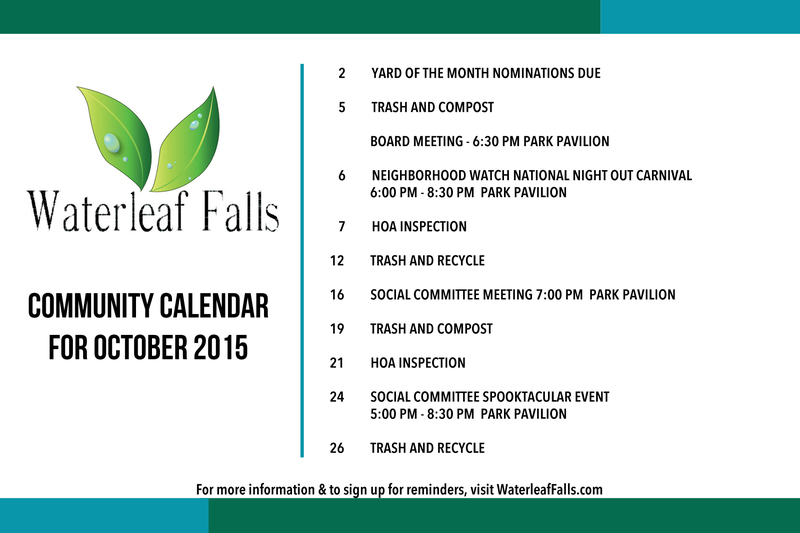 October nominations are due Friday, October 2nd.